A short while ago, I conducted an interview with Institchu UK, a subsidiary of Australian tailoring company, Institchu. 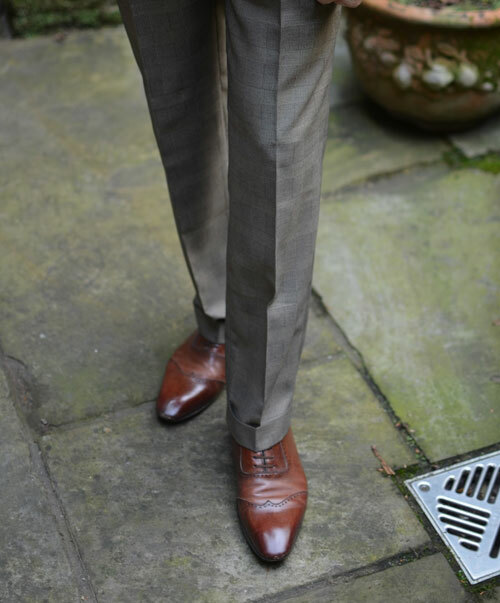 To review the Institchu product, I decided on a Glen check (or Prince of Wales) three-piece – with no overcheck – in a light brown-grey colour that is remarkably flattering on the skin. Unlike many other internet tailors who ask that customers measure themselves, Institchu UK provide a measuring service – at home or in the office – which is reassuring for those who are unwilling or incapable of providing their own measurements. Though the service isn’t free for individuals (£15), it is if you get a group of three or more together. The advantages of this are not only that your measurements are speedily uploaded to your online profile by the Institchu UK measuring tailor, obviating the need for you to worry about this element of ordering online, but that you can see a collection of fabric swatches in person. This is, essentially, a one-off visit so future orders would necessitate being sent further samples but for an introduction to a made-to-measure online tailor, it’s a pleasant hybrid. The alternative is to input your own measurements, which I am also happy with. It’s a matter of confidence in your own ability to take measurements correctly. I undertook this measuring service and took note of the fabric number that I had selected. It is important to do this as you will actually design and order the suit yourself online – selecting the fabric by its number. When on the website, the navigation is fairly straightforward. 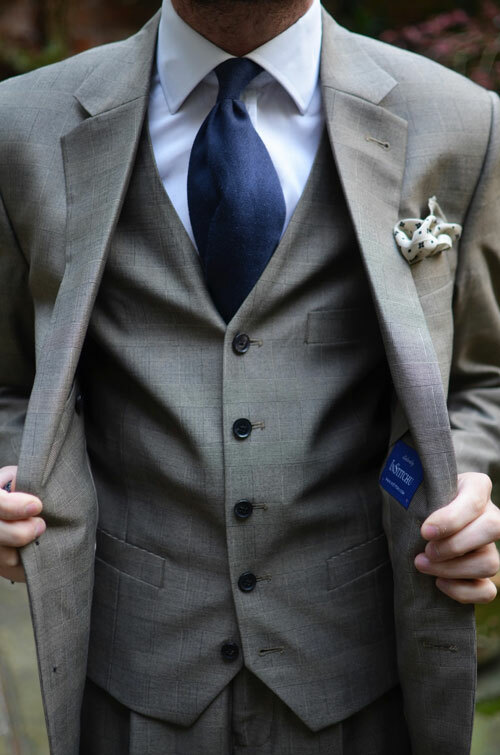 After selecting Suits under ‘The Collection’ you choose the first option: Design your Own Suit. You are then led through the process of designing the jacket first. 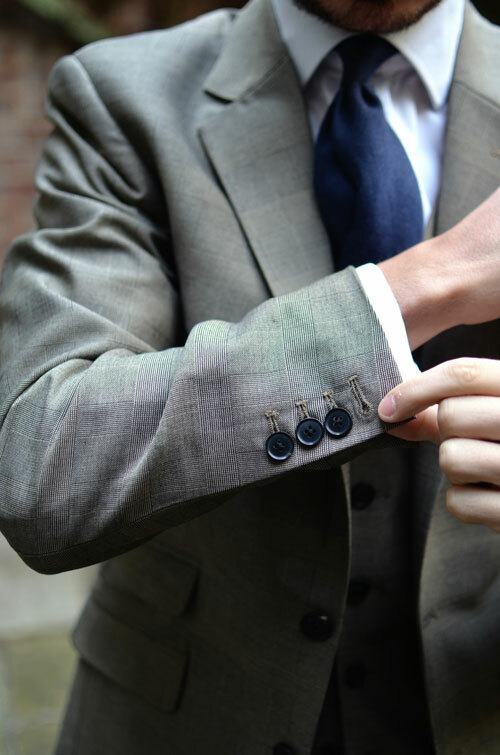 The tweaks allowed are fairly standard: notch, peak, shawl and slim lapels; single or double breasted (note that DBs are £15 more); outer pick stitching on the lapel; a natural shoulder (less padded); vents; sleeve buttons and stitching colour. One of the interesting options is button type, where plastic and horn are offered at no extra charge but there are £5 options for satin, fabric, brass, shell and, interestingly, Corozo nut. You then repeat the process with the trousers and the waistcoat. The former provide the standard options with side-adjusters (which I selected), turn-ups and pocket number/type being the major considerations. 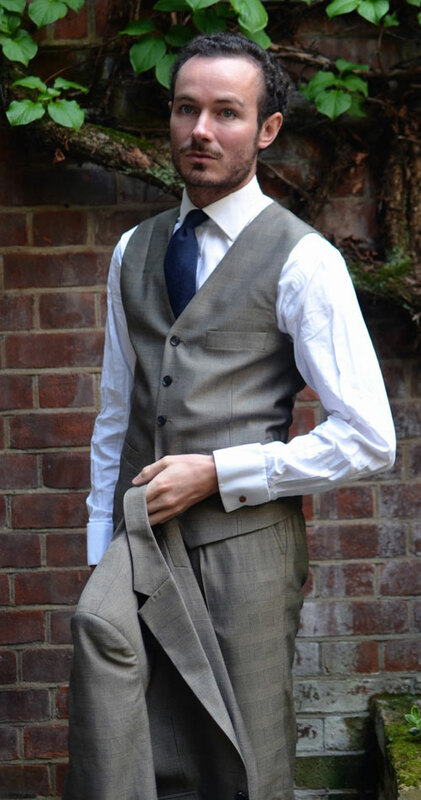 Waistcoats are only available in single-breasted designs with different button and pocket configurations possible. Timing is quick, but not worryingly so. The suit will take approximately one month to be complete from commission to delivery from when the order is placed and confirmed. This suit comes in around £390, which is comparable to Massimo Dutti Personal Tailoring and Dragon Inside, though a bit more than Tailor4Less and Matthew A Perry. The suit was delivered in a rectangular cardboard box. The suit inside was folded into a plastic bag. There is no suit bag provided with the order, which I feel is a shame. For this order, the fabric was no surprise; pleasant or otherwise, as I had seen a swatch in person. The pattern was matched reasonably well across the panels and there were no imperfections. The finish of the suit was of a relatively high standard when compared to other internet tailors, and comparable to Massimo Dutti’s Personal Tailoring line which I consider to have a very high standard for the price point. The jacket is made with a full canvas construction. It has a decent form to the body and the stitching, though machine-finished in most places, is well executed. 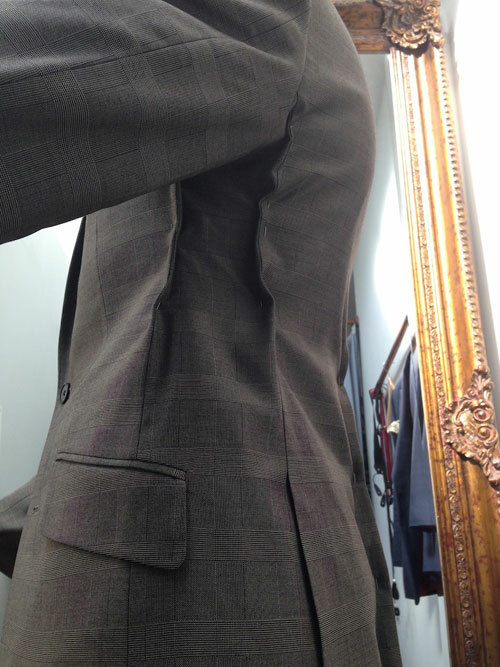 There is also a decent roll to the lapel and the armholes are high and snug. The buttons are dark horn, which are a strong but elegant contrast to the suit. However, I am pondering whether I would change them to light horn. But then, I am always undecided when it comes to buttons. The trousers are perfect and certainly the best trousers I have received from an internet tailor. However, when I first tried the jacket and waistcoat on, there were a number of problems – and, frustratingly, these are problems that seem to frequently occur with internet orders. Given that I was measured for this suit by another, it would also appear that it hasn’t merely been my self-measurement at fault. I took it to the chaps at Cad & The Dandy who managed to fix it in a few days. Like the Matthew A Perry linen suit I had made, the waistcoat was cut far too large for my torso in the chest, resulting in a depressing bagginess. Waistcoats should be as close to the form as possible in my view and I believe that a few wrinkles from a tight fit is far preferable to a characterless stiff-board. My reference point is always the early 20th century photography of three-piece suits; their waistcoats were always incredibly snug. 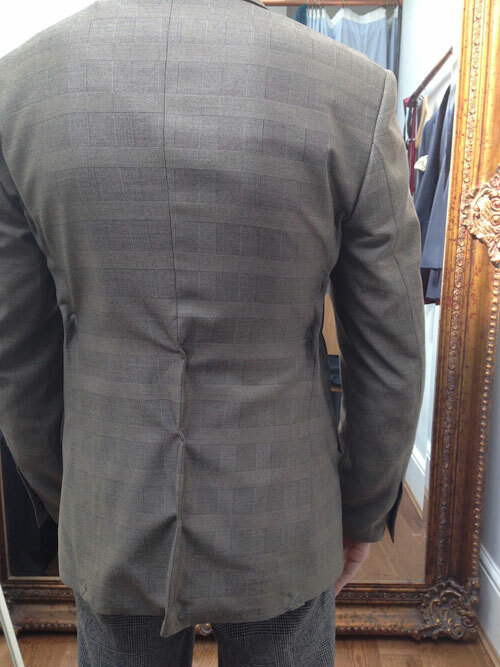 The jacket was fine in the shoulder – I chose the more Neapolitan ‘Natural’ look – and across the upper back but needed quite a bit of pinning and taking in at the centre and side seams (see pictures above) to provide some shape to the waist as it was rather boxy. Some length was also taken out of the sleeve. It’s worth saying at this point that, with internet made-to-measure tailoring, the first suit is often a challenge – and sometimes a disappointment. I had issues with my first Massimo Dutti suit and in that case, as with this, your measurements are updated immediately following adjustments, so it’s important to understand from the tailor you have used for alterations just how much is being done and where it is being done. Secondly, Institchu UK provide a Perfect Fit Guarantee. If you purchase the £10 Suit Insurance with your suit, you’ll be covered up to £75 of your alterations costs. If you haven’t purchased Suit Insurance, Institchu UK will still cover up to £30 on alterations. And, if you are not 100% satisfied with the fit of your garments and feel that they can’t be altered, then Institchu will gladly arrange a Free Remake for you. Fit: 7 out of 10 – for the first effort, it wasn’t a disaster and after being worked on by an alterations tailor it actually feels very good and now has a great silhouette to it. Trousers are excellent and the shoulders in the jacket also very good. However, it was initially quite boxy and shapeless in the waist, so needed a bit doing to it. Fabric: 8.5 out of 10 – far better than the average in terms of quality and range. Touch is pleasant and weight works well with the suit. You can be certain that the fabrics from Institchu are a cut above the grotesque poly-wool monstrosities normally associated with internet tailoring. Service: 7 out of 10 – sent emails regarding the order constantly and delivery is communicated by text and email. The office and home measuring service is a nice touch, but I couldn’t help but feel that this should mean a more reliably good fit. Also, the suit needs a suit bag in the box too. Quality of finish: 8.5 out of 10 – for an internet tailor, this is a very good standard of finish. Stitching is well done, no shoddy pressing or worn fabric, buttons are good, interior construction is good quality and it feels like it is going to last. Overall satisfaction: 7.5 out of 10 – this feels closer to a bricks and mortar tailor, because of the personal interaction – measuring, choosing swatches. It’s similar to Massimo Dutti in terms of service experience. As with most internet tailors, there were problems with the jacket and waistcoat fit. It’s a shame that so much needed doing to it, and that a £400 suit came delivered without a suit bag, because the fabric quality and finish on the product is very high for this category. However, it’s key to reiterate that these problems – and my experience bears this out – tend to be corrected on the second suit, without the need for too much interference from an alterations guru. So which has been the best of all the internet tailors you have reviewed thus far? So far, I’d say Dragon Inside and InStitchu offer the best overall experience. I have to say it looks lovely – the cloth is very subtle and has some lovely colour tones in it. The trousers have a lovely hang too. May I ask how you feel this suit holds up to a Massimo Dutti personally tailored suit? Also, have you ever tried the Reiss personal tailoring service, I’m curious to know what you might make of that?